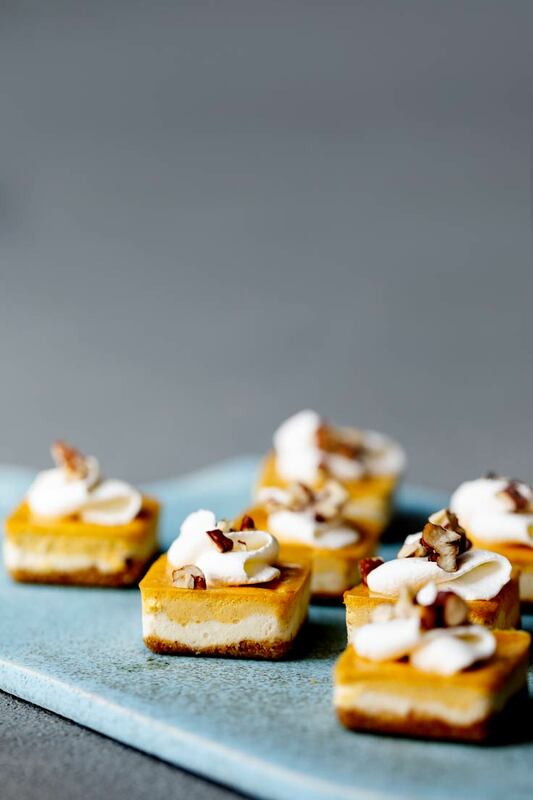 Individual cheesecake bites are a good addition to a tea, brunch, or dessert spread; they can be kept in the freezer until ready to eat, as they defrost quite quickly. 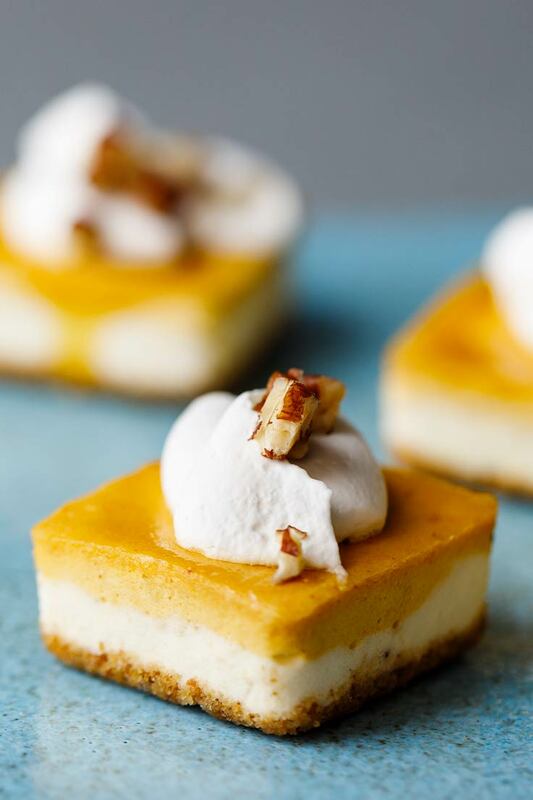 The double layer is pretty and adds to the subtle flavors of pumpkin spice, maple, and orange. Makes about 4 dozen cheesecake bites. 1½ tsp Amoretti® Natural Pumpkin Spice Extract O.S. ¼ tsp Amoretti® Maple Extract W.S. ⅛ tsp Amoretti® Natural Orange Extract W.S. Combine all crust ingredients and press into a mold. For small squares use 1 tsp per square. Press down evenly. Bake for 10-12 minutes then set aside to cool. Leave the oven on. Beat the cream cheese and sugar until the mixture is free of lumps, scraping the bowl regularly. Add the egg and the Amoretti Madagascar Bourbon Vanilla Extract and combine, scraping the bowl regularly. Add the sour cream and cream and mix until smooth. Fill the cooled crusts ½ way with the Plain Cheesecake mixture. 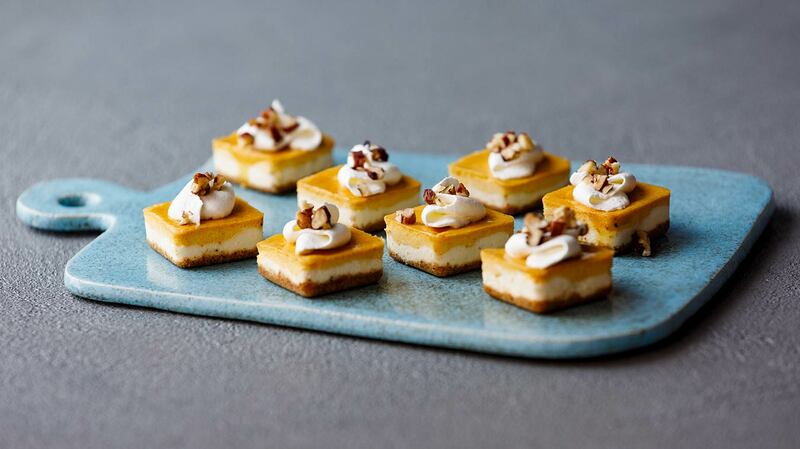 Freeze for 20-30 minutes while you prepare the pumpkin cheesecake layer. Beat the cream cheese and sugars until the mixture is free of lumps, scraping the bowl regularly. Add the whole egg and yolk, and mix, scraping the sides of the bowl. Add the pumpkin purée, Madagascar Bourbon Vanilla, and Pumpkin Spice Extract. Mix well, scraping the sides of the bowl. Pour the Pumpkin Cheesecake mixture on top of the frozen Plain Cheesecakes, filling to the top of the mold. Bake in a water bath for 18 minutes. Set aside to cool completely. Remove mold from the water bath and freeze at least two hours or overnight. In a small saucepan combine the sugar, corn syrup and ¼ cup orange juice. In a small bowl combine the cornstarch and the remaining ¼ cup orange juice, stirring to mix thoroughly. Bring the sugar, corn syrup, and orange juice to a boil in the saucepan. Stir in the combined cornstarch/juice “slurry” and stir until the mixture begins to boil. Remove from the heat and pour the glaze into a heat-proof bowl. Add Maple and Natural Orange Extracts and stir to combine. Let the glaze cool for about 20 minutes before using or set in an ice bath to cool slightly, the glaze should be warm but not so hot as to melt the cheesecake. Pop frozen cheesecake bites out of the mold and place on a parchment lined sheet pan. Gently brush the warm glaze over the top of each frozen mini cheesecake. Top with whipped cream and a sprinkle of pecan pieces. Chef Barbara used a silicone mold with square cavities (find the link under SPECIAL EQUIPMENT) but a standard 9″ × 13″ pan would work well in a pinch! After baking, trim the edges then cut to 1.5" squares for individual servings with minimal fuss.